Asked if the United States is winning the war in Afghanistan, Obama said "no"
(CNN) -- President Obama says the United States could be open to reaching out to some moderates in the Taliban in a manner similar to successful efforts with Sunni militants in Iraq. 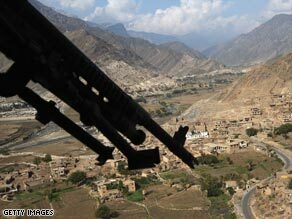 U.S. forces have been engaged in fierce fighting to oust the Taliban in Afghanistan. But two analysts Monday expressed separate cautions about such an effort. In an interview published in The New York Times this weekend, Obama said some military leaders believe part of the success in Iraq has come from reaching out to Sunni militants there. Regarding the Taliban in Afghanistan, the president said that while the situation is much more complex than in Iraq, "There may be some comparable opportunities in Afghanistan and Pakistan." "If you talk to Gen. [David] Petraeus, I think he would argue that part of the success in Iraq involved reaching out to people that we would consider to be Islamic fundamentalists, but who were willing to work with us because they had been completely alienated by the tactics of al Qaeda in Iraq," he told the Times. Petraeus is the U.S. commander in the region. But Obama added that Afghanistan's complexities -- "a less governed region, a history of fierce independence among tribes," he said -- mean that developing a new strategy "is going to be much more of a challenge." Asked if the United States is winning the war in Afghanistan, Obama said "no." Given that remark, Gary Berntsen, a former CIA officer who led CIA forces in Afghanistan after 9/11, said Monday that it could be difficult to get members of the Taliban to work with the United States. "If you keep saying the Taliban are winning, what incentive is there now for individuals who are fighting against us to come over to us?" he said on CNN's "American Morning." In Iraq, the United States embraced Sunni tribal leaders and brought them over to the American side to help fight al Qaeda and decrease the violence. But, Berntsen said, that strategy might not work in Afghanistan. "Afghanistan is clearly not Iraq. The problem in Afghanistan is you might be able to split individuals, but you're not going to be able to split entire groups," he said, noting that Afghanistan has numerous networks. Trying to engage the Taliban directly, Berntsen said, is not a good idea. "You don't want to reach out directly to them [from] the United States. You want to work through the Afghans," he said. "You want to be working with the Afghans as partners as you reach out to individuals. You're not getting them as a group. If you do bring some of them in as a group, they'll cooperate with you just like they did in the Swat Valley in Pakistan, but the second you're gone, they're going to start abusing the population, violating human rights," he said. In 2007, the British managed to bring a Taliban commander, Mullah Abdul Salam Zaeef, over to their side and made him governor of the Musa Qala district. But now, there are complaints about him and allegations of corruption. There have been success stories, though, such as when former Taliban commanders became members of the parliament. Berntsen said that has worked because the leaders get a voice, but not executive power. Peter Bergen, CNN's national security analyst, said neither the United States nor the Taliban appear to be ready for negotiations. As the United States moves toward a strategy shift, Berntsen said the situation is best placed in the hands of Petraeus and U.S. special envoy Richard Holbrooke. "The White House would be wise to allow Holbrooke and Petraeus to work on this thing and for them to not comment all that much on this because the reality is they don't have experience on the ground, doing this sort of thing, most of them," he said. During the campaign, Obama drew criticism for saying he would be willing to meet without precondition with leaders of nations that had been hostile to the United States. Then-Sen. Hillary Clinton called the remarks "irresponsible" and "naive." Obama later clarified to say that "without precondition" does not mean without preparation, including preliminary diplomatic work.